Some how time always seems to get away from me. The last time I posted was at the beginning of August, so I apologize for such a long delay. To be honest its been a huge drag waiting to find a place for my art centre. As I have said in earlier posts, commercial real estate is painful and nothing I would recommend to anyone who wants to get things done quickly! Its like watching paint dry. So in an effort to remain some what useful, I have been busy trying out mediums and reintroducing myself to old favourites. One night I was thinking of potential projects to do with students and it hit me that stained glass and/or mosaics could be an awesome addition to my classes. No one is offering this type of class to people with disabilities and was even questioned as to how I could possible do this type of craft with people with disabilities. I was pretty shocked as I think ANY craft can be adapted and made safe with the right frame of mind. So I got to work, thinking how I could adapt programming to ensure safety for all. 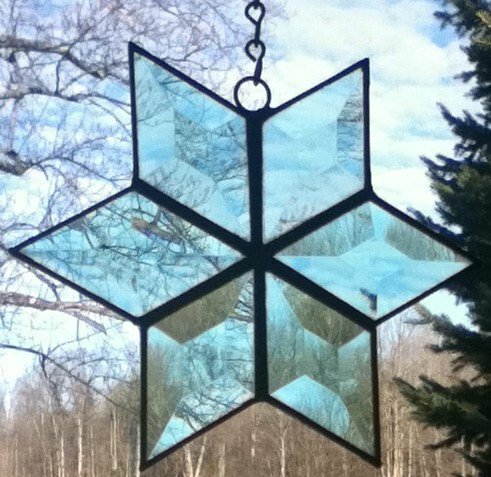 Bevel snowflakes…one of the “safest” stained glass projects that always turn out beautiful! I say safest because with bevels there is very little chance of cutting yourself because the edges are not sharp. Its also an easier project to use with copper foil because the sides are flat, which makes putting the copper foil on easier. So this is coming from me, someone who has been helping her mom do stained glass for years, so I got my boyfriend to try to foil a bevel. He was worried about making a mistake but really with the tape if you do make a mistake, you can take the piece off and start again. It’s very much like using a sticker and putting it on the edge of the glass. He actually did really well. I have a few more people I’m going to try to demo with this to see where there may be potential pitfalls. But I think I will definitely add this to my class list. 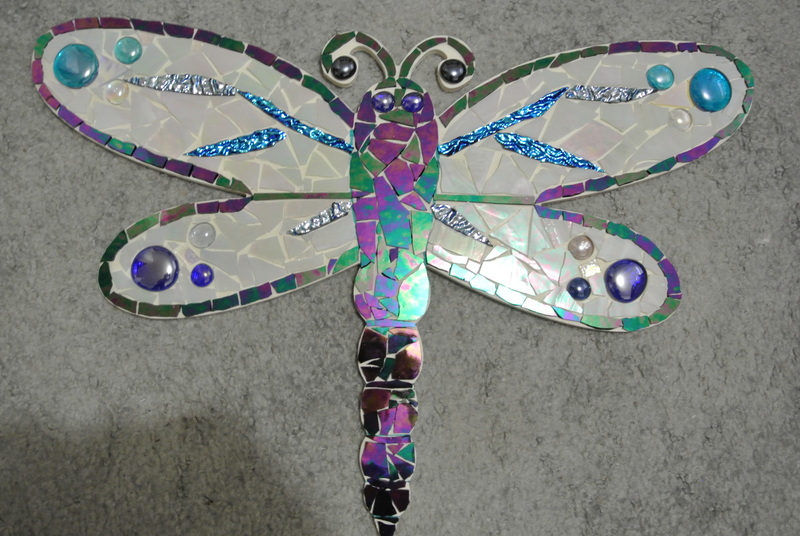 Along with this I looked at how to do mosaic work with people with disabilities. I used to be a mosaic artist when I was in school and its something I really enjoy. Again I thought about how I could do this with very little opportunity for people to hurt or cut themselves. 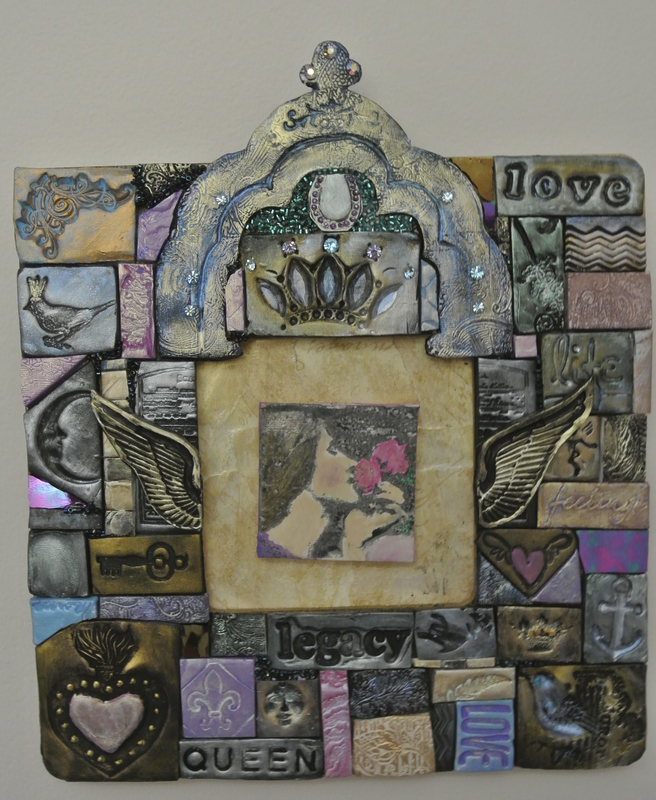 While wandering around Michaels, I saw a book called “Mixed Media Mosaics” by Laurie Mika and was totally inspired. In this book, Laurie makes tiles out of polymer clay and awesome and easily useable medium. I became inspired and made one of my own mosaic projects to try out the medium. While quite time consuming, I had a great time experimenting with the clay, pushing objects into it and letters to make words. Then using mica and acrylic paints to create different looks on the clay. I will also offer this as a class option. I think it would also work really nicely with scrapbooking or journaling. I also made a glass mosaic to get myself back in the habit of working with glass again. This is an area that I will have to think about how to make it safe. I think if I just used glass globs that the projects could be entirely safe. 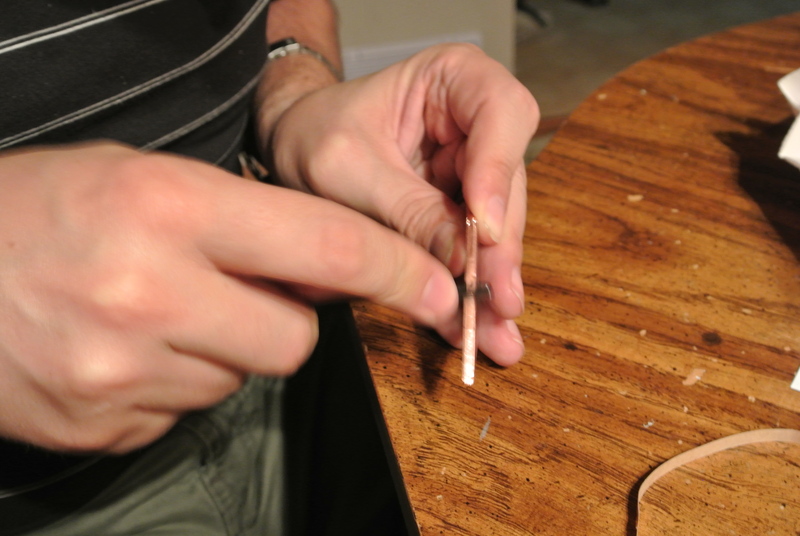 Or else I can pre fab the pieces of glass, grind the edges to make sure that people don’t get cut. Either way stained glass and mosaic work will definitely be options as Mandala Art Centre. If anyone has any ideas of how to make these projects safer, please let me know!